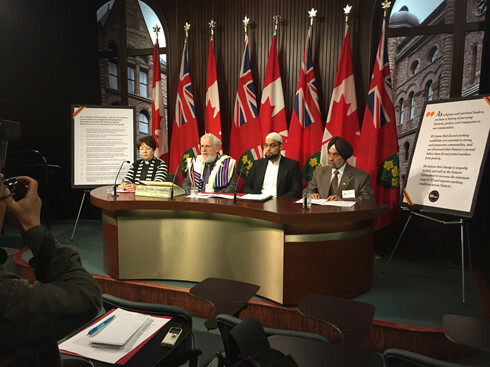 "One of the initiatives I have been involved in as the representative of the Toronto Board of Rabbis to the Interfaith Social Assistance Reform Coalition is an effort to update labour laws to give protection to precarious workers. It is called the Campaign for $15 and Fairness. The element of the Campaign that has received the most media attention is the effort to increase the minimum wage in Ontario to $15 from the current $11.40. The government has responded positively by tabling Bill 148 the Fair Workplaces Better Jobs Act and Committee hearings were held earlier this month. This has been a two year effort of collaboration between Unions, community groups and faith leaders. I was active in the effort to mobilize around 200 faith leaders from a very broad range of religious communities in Ontario, 27 of whom are Rabbis and as well 4 other Jewish clergy. The statement is located at http://15andfairness.org/faith-leaders and I invite you to go to it and sign on. This is a degree of Rabbinic involvement in public policy campaign never before seen in Ontario, let alone one pursuing worker and union rights. This video is from the subsequent community media conference I participated in at the Queen's Park media studio on July 21, 2017 on the last day of the Committee's public hearings."